Since I used the picture of the little robin to illustrate another poem, I needed something different for "Hope is the Thing With Feathers". 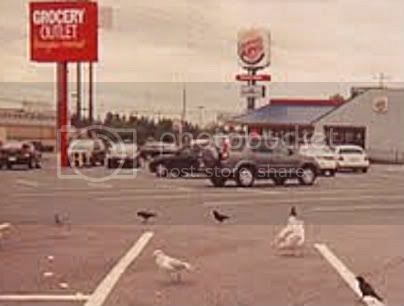 I'm not sure if the pigeons outside Seattle's Aurora Discount Grocery have "have asked a crumb of me". Perhaps they have -- they do like crumbs when they find them. Still, something in that barren parking lot spoke to me of the need for hope.